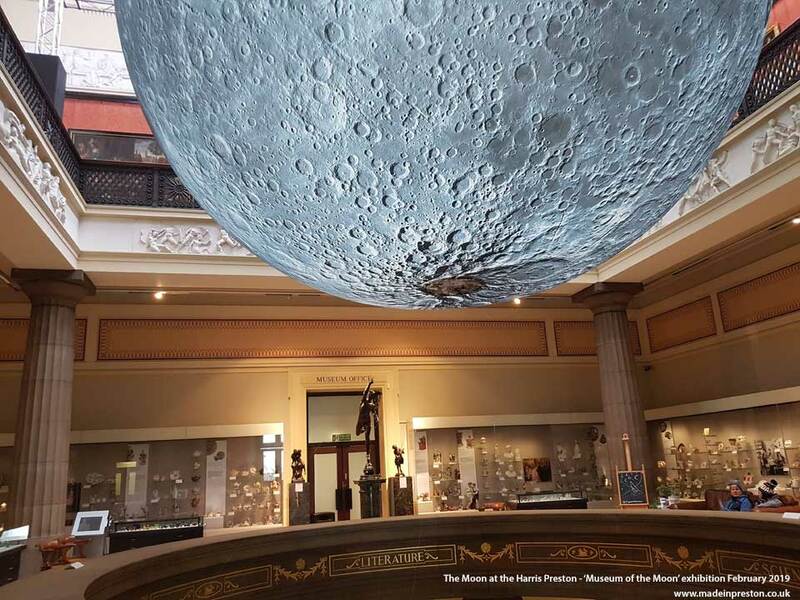 This is an excellent exhibition at the Harris in Preston, The Museum of the Moon until 24th February 2019. The star exhibit being a 23ft diameter moon hanging over central atrium, at night it’s illuminated. While we were there dozens of school children were visiting and with half term coming up it’s bound to be a favourite and free entry. 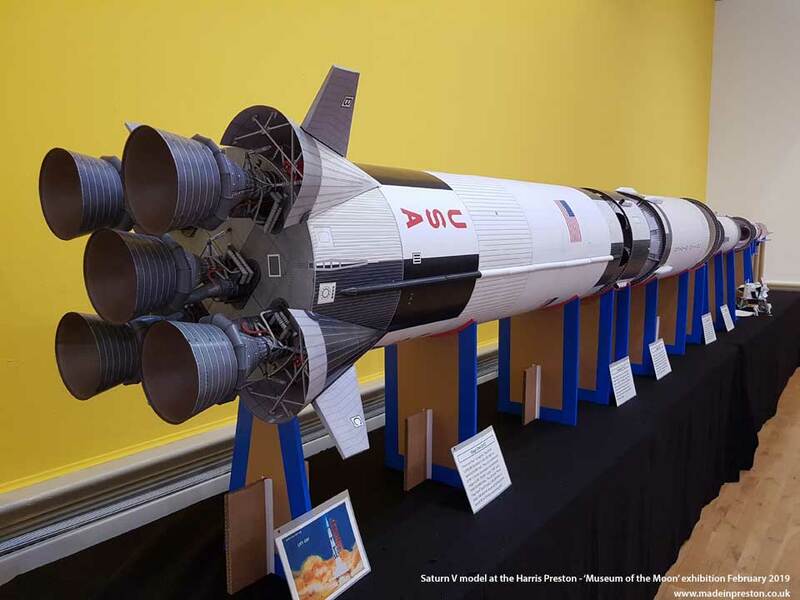 Another excellent piece of work is a precise paper model of the Saturn V rocket that took the Apollo missions to the moon. This large model is around 20ft long and built to scale. 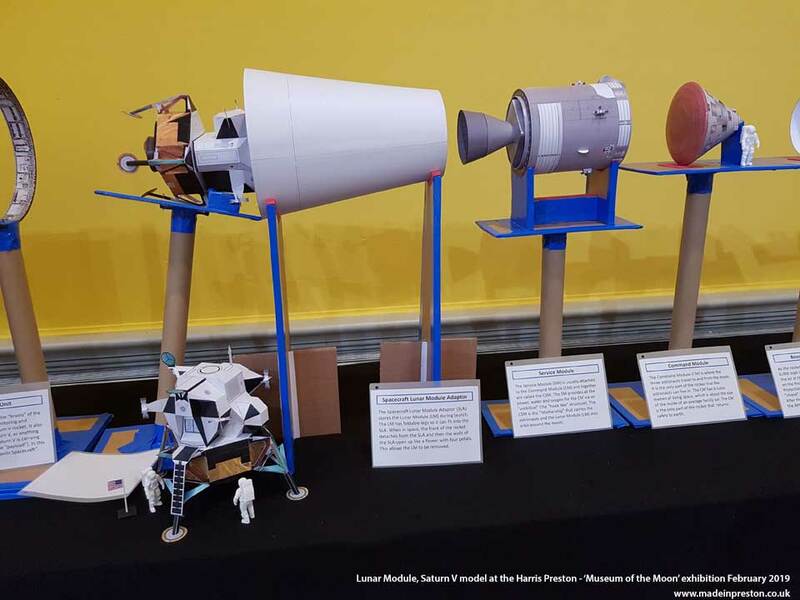 From the model the rocket stages can be clearly viewed including a model of the Lunar Module that was transported in the rocket. The actual rocket is a phenomenal size almost like blasting off Blackpool Tower, there is one at the Space Centre in Florida. 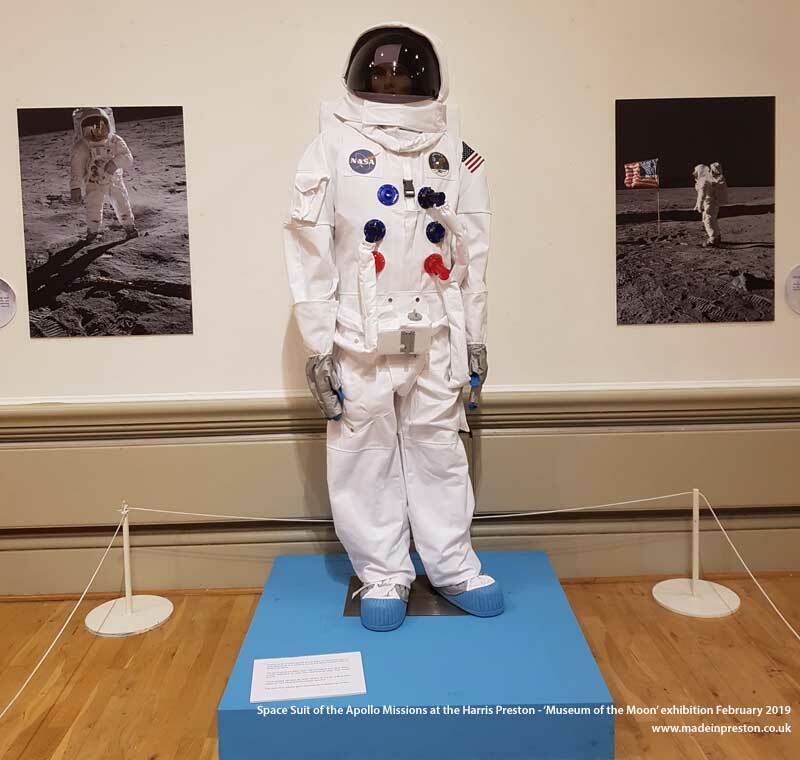 The space suit of the Apollo astronauts is shown. 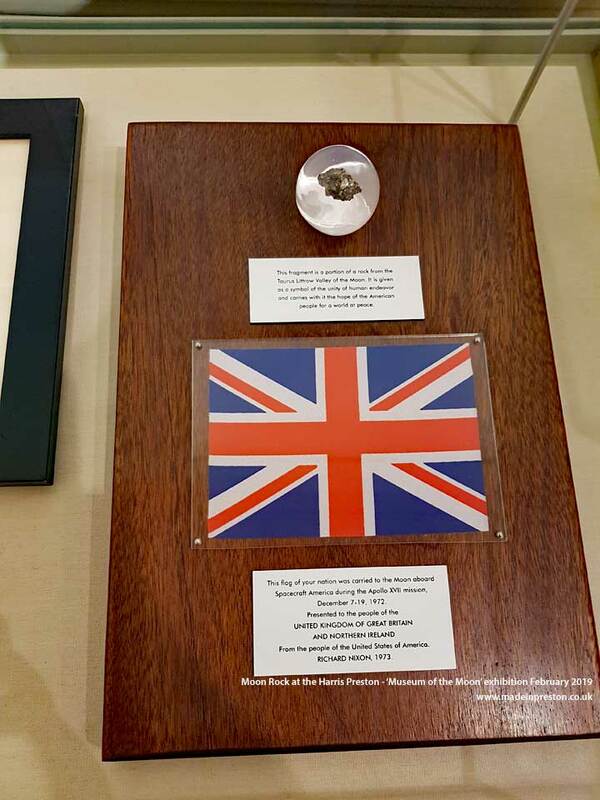 A piece of moon rock. 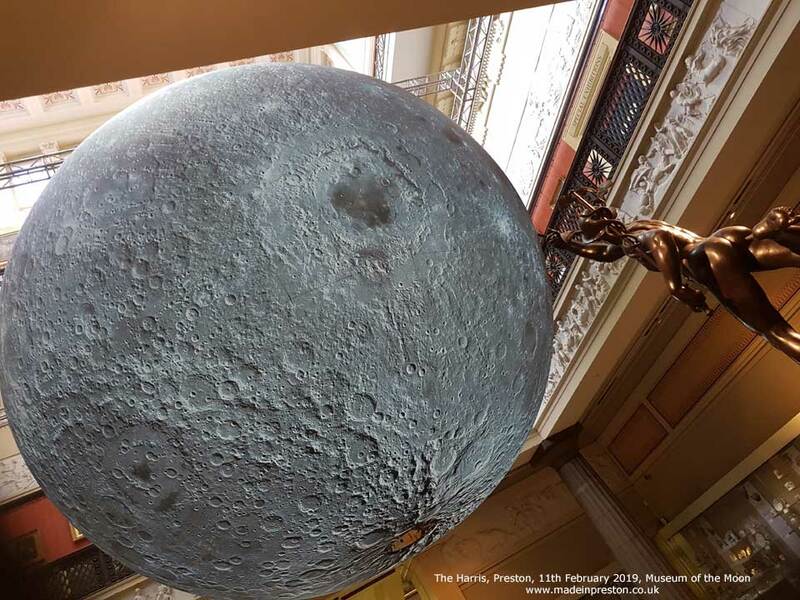 The model of the moon in context at the Harris Museum of the Moon, Preston. There is also a computer from the space ship which being in the 1960s is less capable than a cheap calculator depending far more on human skills, as we saw in the movie Apollo 13 with Tom Hanks which required to be manually steered back to earth due to a malfunction. The exhibition contains many moon oriented themes with poetry, maps, paintings and family activities. Don’t we love the man in the moon. This entry was posted in Uncategorized and tagged Exhibition, Harris, Museum of the Moon, Preston. Bookmark the permalink. the Made in Preston website, since 2002. Information about things made in Preston and its surrounding area. Made in Preston website established in 2002. Contact Pete to find out more using this link.